The distance travelled by the vehicles of your flees from the starting point to the place of destination is an essential parameter used to optimize the routes used. What is your target: to reduce costs or to deliver to the customer on time? Regardless of your answer, SafeFleet helps you route the shortest and least expensive routes. SafeFleet helps you to calculate the best route to reach your destination on time, complying with the traffic restrictions. 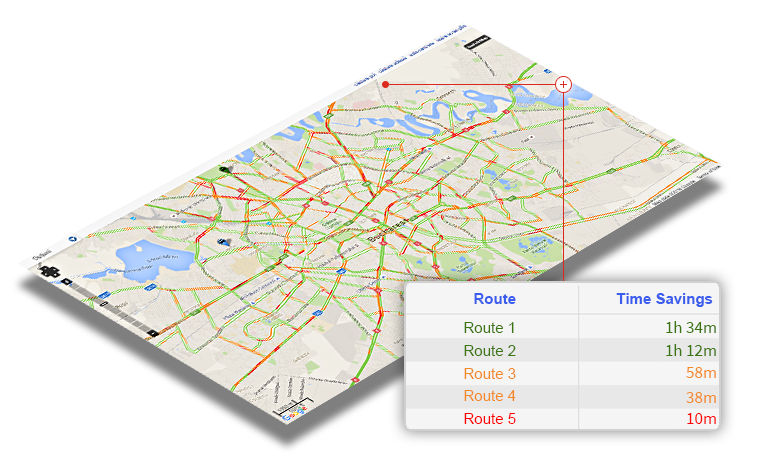 When you set routes based on time, the app generates the optimal solution, by taking into account several variables: restrictions on the travelling directions, restrictions on the HOV lanes, restricted manoeuvres, seasonal restrictions, etc. The shortest route is not always also the cheapest one. In order to keep operating costs under control, SafeFleet helps you find the best solution based on the route chosen and based on the vehicles’ specifications. By calculating the road taxes for a route and the operating costs taking into account the vehicles’ specifications, you will be able to find the route with the lowest costs.